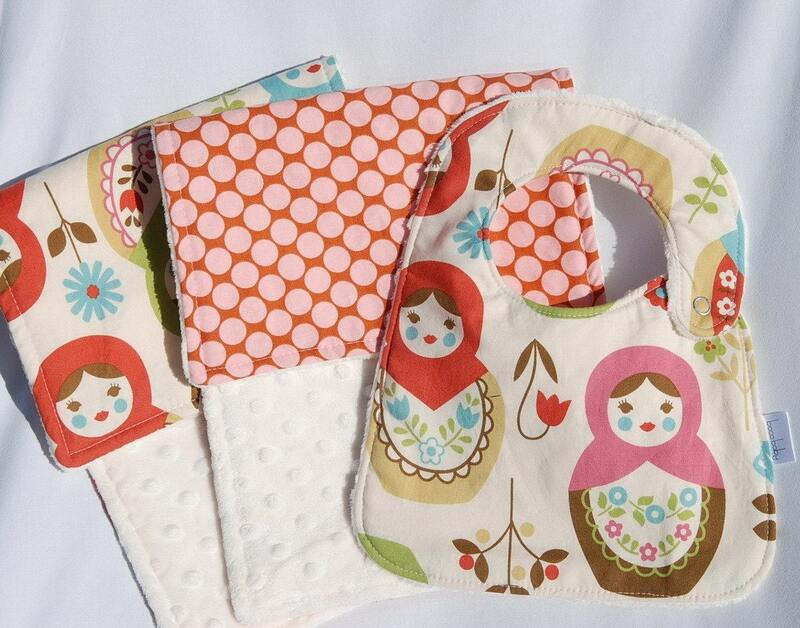 My Messy Manger: Feature Friday: Matryoshka Madness... and a Giveaway! 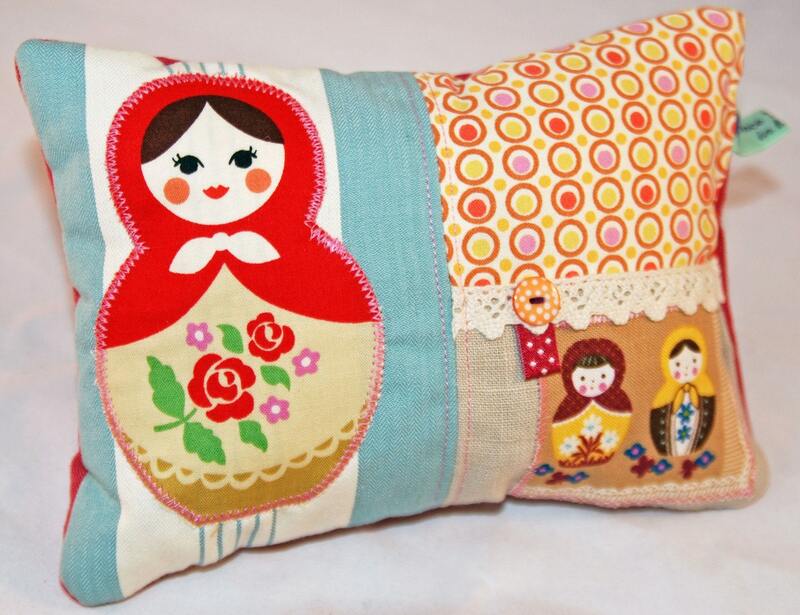 Feature Friday: Matryoshka Madness... and a Giveaway! I don't know if you know this about me, but I really love matryoshkas, otherwise known as Russian nesting dolls. Moldova, being a former Soviet country, embraces the matryoshka and has a lot of really cute ones for sale at the art bazaar. You'd better believe I'm getting one for a souvenir before we come home. I love the simple boldness of it, with some cute prints mixed in... and the buttons are such a great touch. 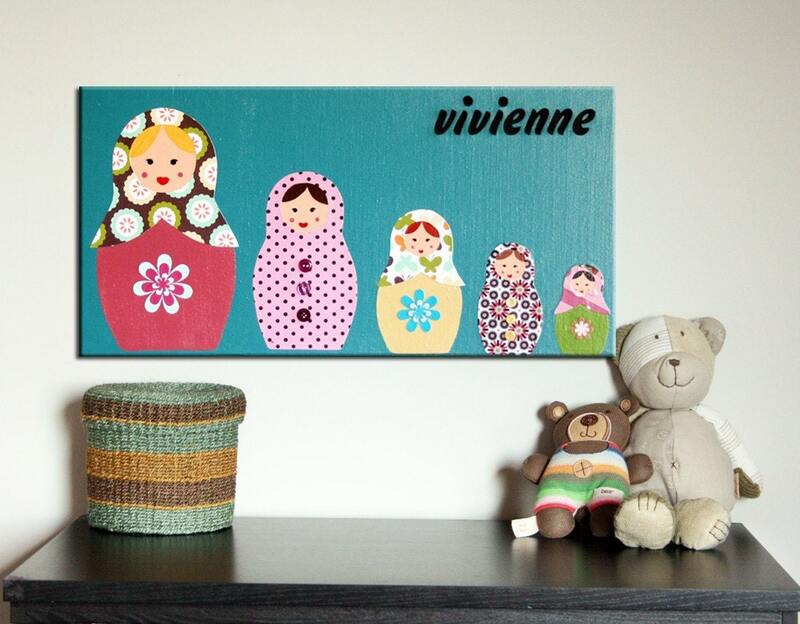 She has a lot of other funky, bold children's prints and canvases that are totally worth checking out, and she also keeps a blog where she posts some really cool crafty projects. I love how she included the extra pieces of the babushka (the Russian word for grandmother or the head scarves that they wear) that ties under her chin. Such a great touch. If you like to sew, you really need to go look around her shop. She has some really cute, original, and affordable sewing patterns. And did I mention that she is offering a 25% off coupon code just for My Messy Manger readers? Oh yes, she did! Just enter MYMESSY25 at checkout... and send her a nice thank you message while you're at it. I can think of so many places that these would be adorable... a tea towel, skirt, pillow, quilt, apron, or on the wall in vintage hoops like she has done. They are so sweet and whimsical and I love the little details. 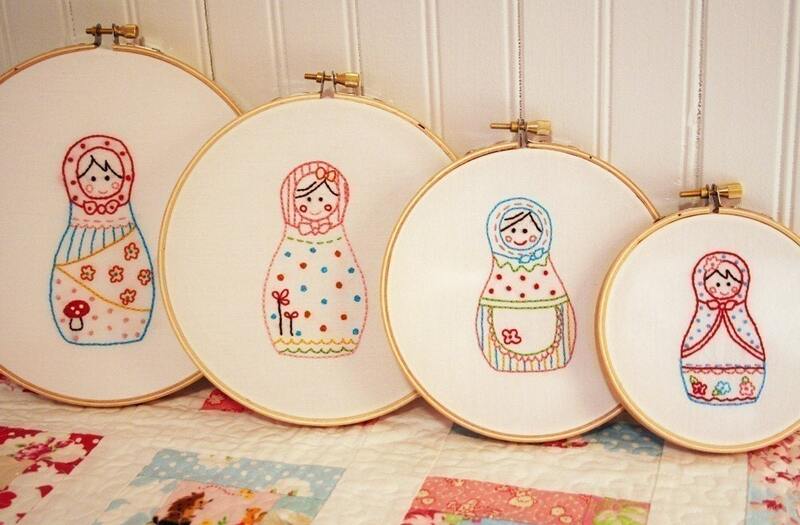 Her shop is full of adorable embroidery patterns like these and also prints and paper products with adorable, whimsical designs. Did I mention that her stuff is adorable? And whimsical? Because it is. She also has a blog where she writes about her adorable, whimsical creations, home decor, and daughter, and even has the occasional giveaway. And Tasha is also offering a coupon code for My Messy Manger readers! Just enter MESSY50 (and a sweet thank you note, of course) at checkout to get 50% off the Russian Sweeties Embroidery Patterns Set! What a steal! These girls just crack me up every time I look at them! They look tired and dazed, which is exactly how I feel much of the time. 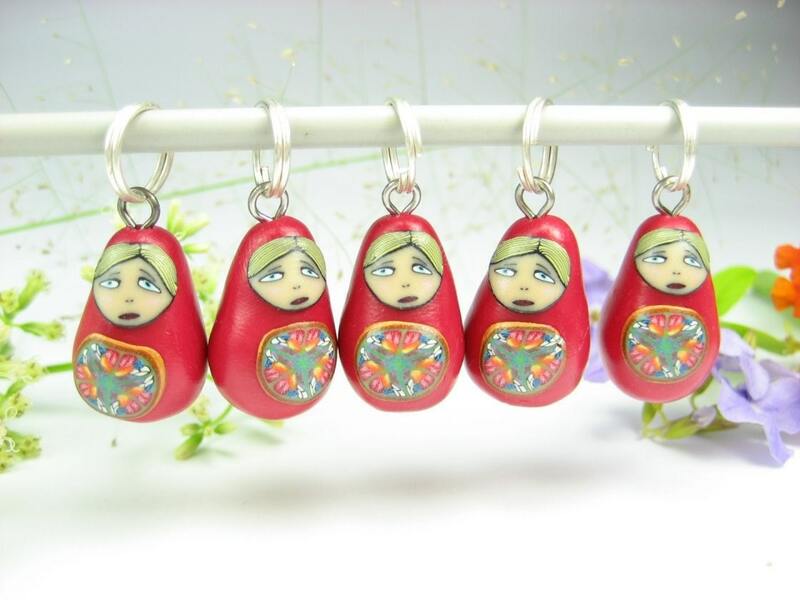 She has a lot of incredibly creative stitch markers and jewelry in her shop, and you just have to see the detail in her work for yourself, it is very impressive. What I really love about these dolls is that they make them in almost any skin and hair color, so you could get one to match your little girl's features. And the little hearts are such a sweet touch. They also sell some other adorable handmade items; I particularly love the Fridge Magnet Cotton Bunting. You can also check out their blog, and give them some love on their Facebook page. The set includes a matching minky bib, two minky burp cloths, and an 18 month sized onesie. She also has a matching baby blanket in another listing, and she makes these baby accessories in a wide variety of funky prints, and anything from her store would make an awesome baby gift. So maybe you don't have any sweet baby girls in your life right now, but you do have a sweet furry girl who owns your heart. 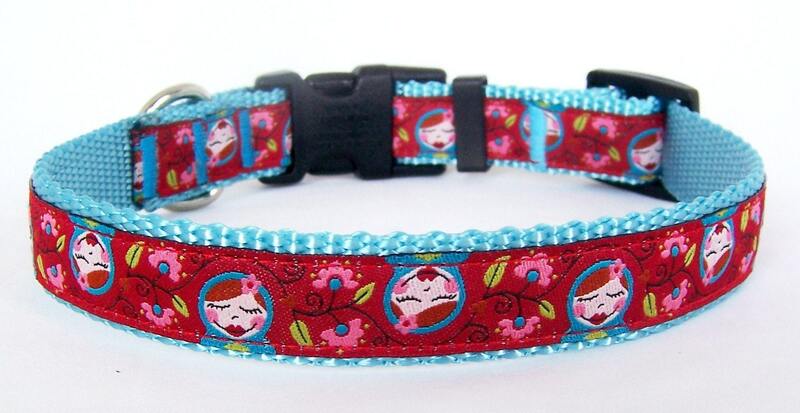 How about getting her a Matryoshka Girl Dog Collar from Day Dog Designs? She can make it in any size to fit any pooch, and she has the best selection of some of the cutest dog collars I've ever seen, as well as leash purses and cable knit sweaters for your furry friend. I love the detail and obvious craftsmanship that she's put into these pillows, and I especially love the little bit of lace. She has several other equally beautiful scented pillows that are worth checking out. She also keeps a blog where she highlights new stuff in her shop. Seriously, I could do individual features on each of these shops, because there is SO MUCH amazingly creative and talented work represented here. I had no idea what I was getting myself into when I started looking around all of these shops. Please take some time to check out each of them, it is truly worth it. And now for the part that you've all been waiting for... a giveaway! 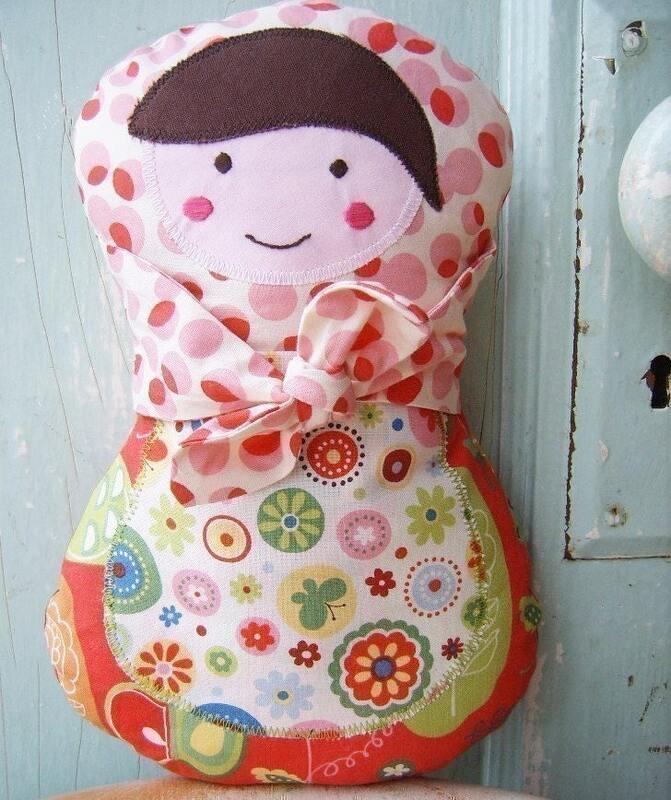 Arlene from Winter Peach, in addition to the fabulous coupon code, is also giving away a free Lucy Babushka doll sewing pattern to one lucky winner! Go to Winter Peach and tell me one other item in her shop that you love. So there are FOUR ways you can enter to win! Comments will close at 12 noon Central Time on Monday, March 28. The winner will be randomly chosen and announced on this blog immediately. And stay tuned next week for another awesome giveaway from Day Dog Designs! I'm so excited! Just for the record- I have received nothing from any of these sellers and I don't get any commission from any of their sales, I just really love their stuff and love to share stuff I love. I LOVE her little girl shoes. I saved her etsy site for a future date - knowing I'll be able to sew little girl shoes soon. LOVE that zipper boot pattern in her shop. So cute!! thank you for featuring my cushion. 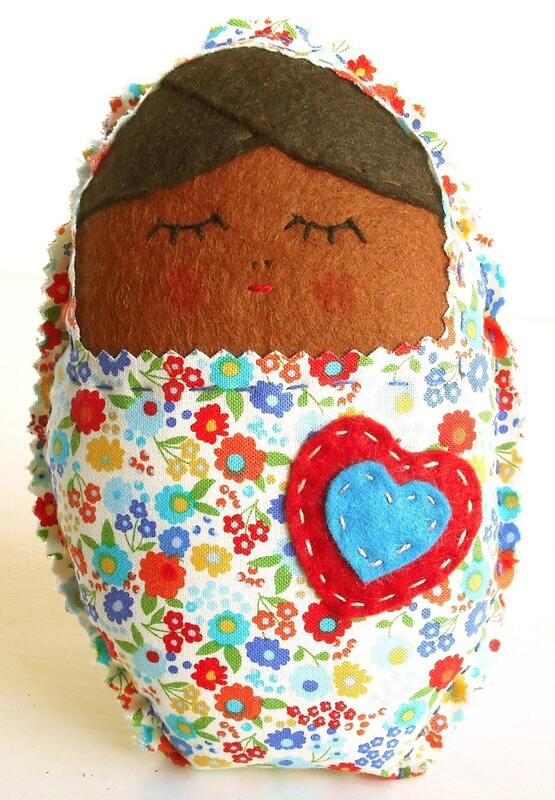 I love all the Matryoshkas here, what a diverse and creative collection of ladies they are! Your feature is fantastic and shows off a wealth of talent- it also colourful and lovely. mary jane flats! super cute! I LOVE all the cute shoe patterns, but the booties are especially precious...perfect for these long, cold Canadian winters! I love that little cushion, how adorable! Thanks so much for featuring my canvas, you write so well! What a great idea for a post. I love all of the finds that you shared. I think I'll have to check out that first one; that canvas is really neat. Wonder where I might put it if I bought it. Those maryjanes are so cute! But a close second is the little shirt with the tie and suspenders. Bet my guys would be adorable in those!